It’s that time of the year when we release the alumni report – an informative snapshot of data that describes the position of alumni from the top B schools of the country. Our alumni report analyses the industry trends and highlights which companies, locations and functions are most popular among MBAs from the top institutes of the country. Last year’s trend was that of a secular shift from banking and finance towards consulting. This year’s data provides added evidence in favour of this trend. Banking and finance never really managed to recover their lost mojo. – Use this report to understand which way the industry trends are moving. The trends in locations, companies and functions will give you an accurate idea of what are the hottest career choices of India’s best and brightest. 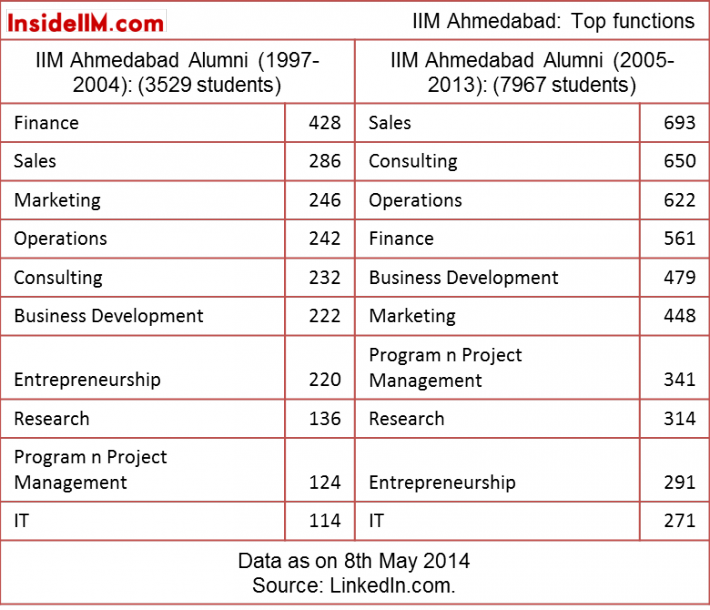 This will let you make a more informed choice when you graduate from MBA. – Use this report to understand your chances of getting into a particular company. It is a well-known fact that recruiters prefer to recruit students from their own campuses. This B school favouritism has a strong impact on your chances of joining a particular company – you need to know how firmly entrenched your seniors are in your dream company. We have considered people who have mentioned the six older IIMs as part of their ‘Education’ between 1997 and 2014 on their LinkedIn profile as our universe. This report focuses on three aspects (top locations where they work, top companies where they work and main organizational functions). 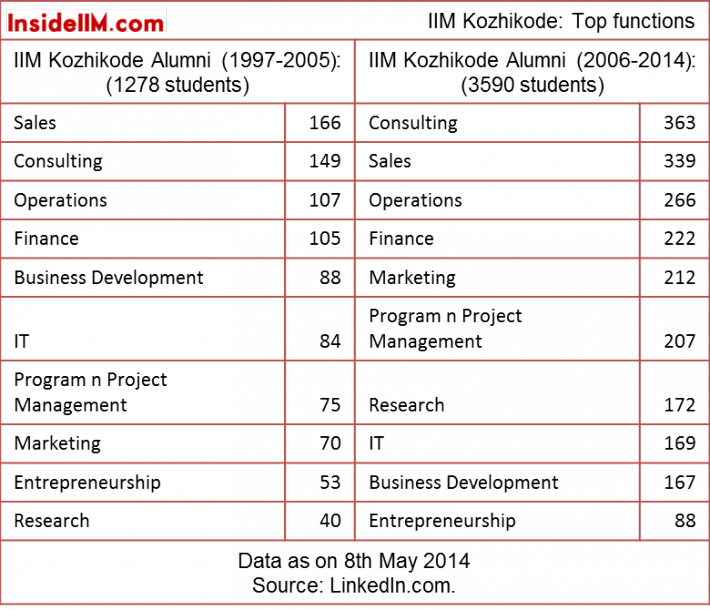 The time period for the study, 1997 to 2014 – includes 18 batches of the flagship program at these IIMs(15 and 16 in case of IIM I and IIM K). This period has been divided into two equal parts – 1997-2005, and 2006-2014. 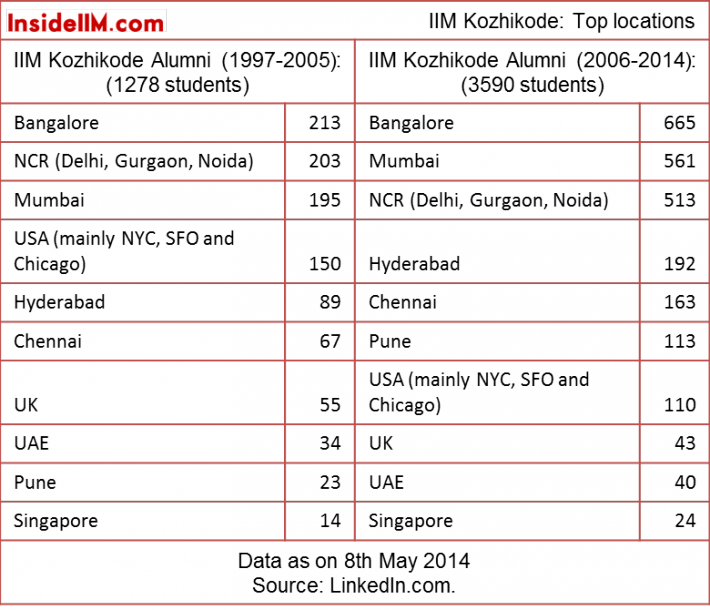 – Statistics reflect current status of alumni, and do not contain historical data: For e.g. if someone moved from Goldman Sachs to McKinsey, they would be listed under McKinsey. 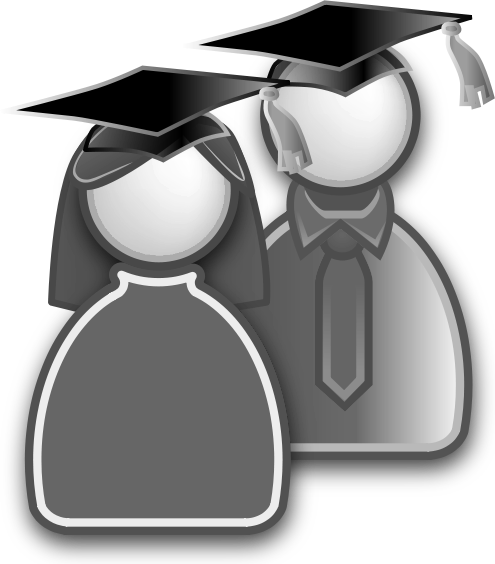 This ensures that the data accurately represents current occupation of the alumni, except in cases where LinkedIn profiles have not been updated – nothing much we can do about that. – Fake profiles: Given that we have used aggregate data, it is not possible to verify every single data point. As a result, there may be a few fake profiles in the data, however, given the large sample size, this is not a big problem. – Internships: Students currently doing an internship at a particular firm, will be reported under that firm. – Other issues: In case a person has done a short-term course at the institute ( a 3-month MDP course or even a 3-day course), the person may be counted in the results. i.e., the data doesn’t map perfectly with the students of the flagship programs of these B schools. 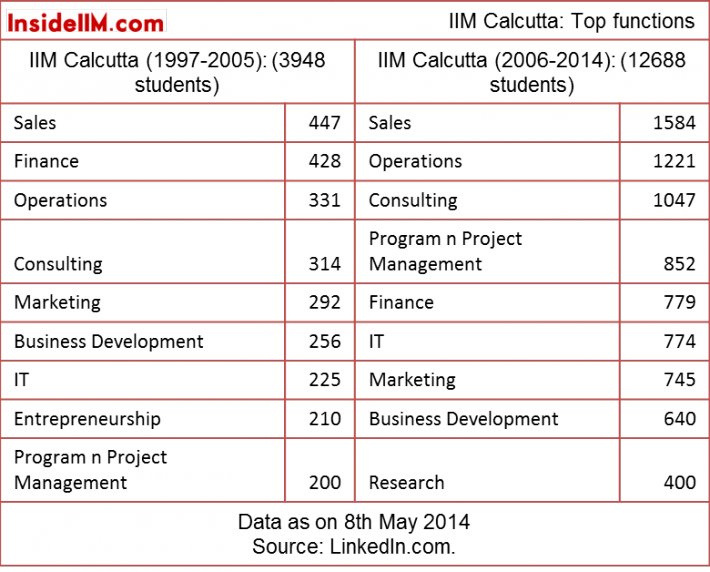 Again, we see a clear shift from investment banking towards consulting at IIM A. 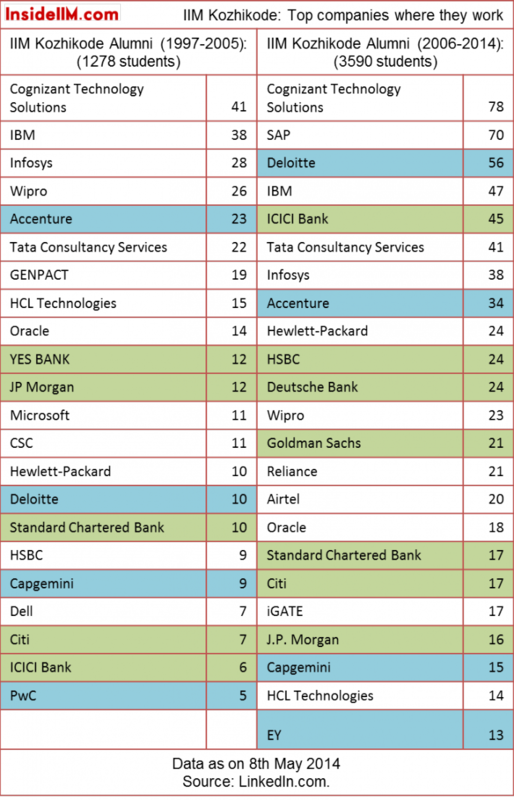 From top investment banks in the earlier decades, it now seems to be McKinsey, BCG and Bain who seem to be attracting the best candidates of IIM A. Among functions, the growing popularity of sales & marketing, and consulting is evident. 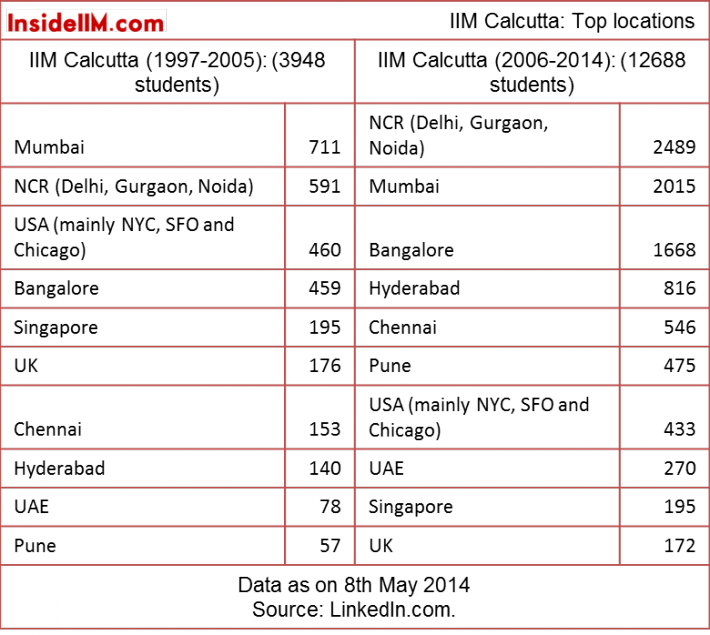 NCR seems to have stolen a march over Mumbai over the years when it comes to attracting top MBAs. 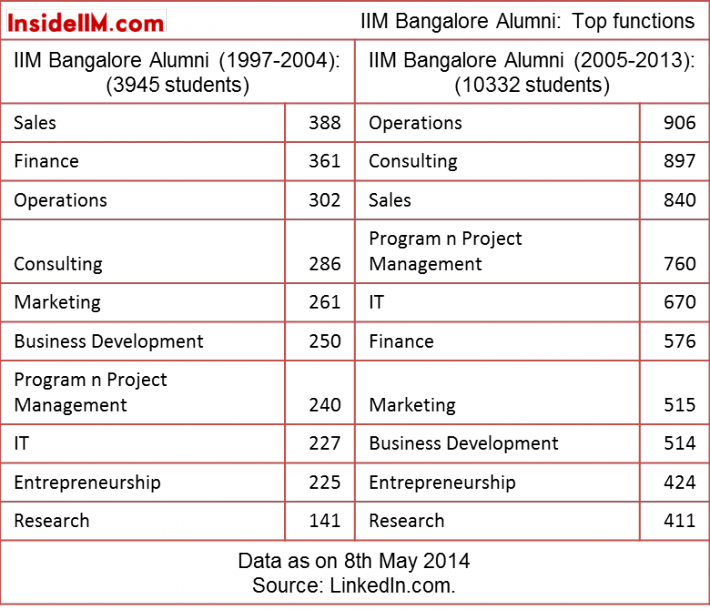 IIM Bangalore’s data is influenced by the specialized program it started for IT managers. This is different from the flagship program. This explains the preponderance of Bangalore-based IT firms in the results. You can still notice that banks have slipped down the hierarchy over the years, even as consulting firms have gained preference. 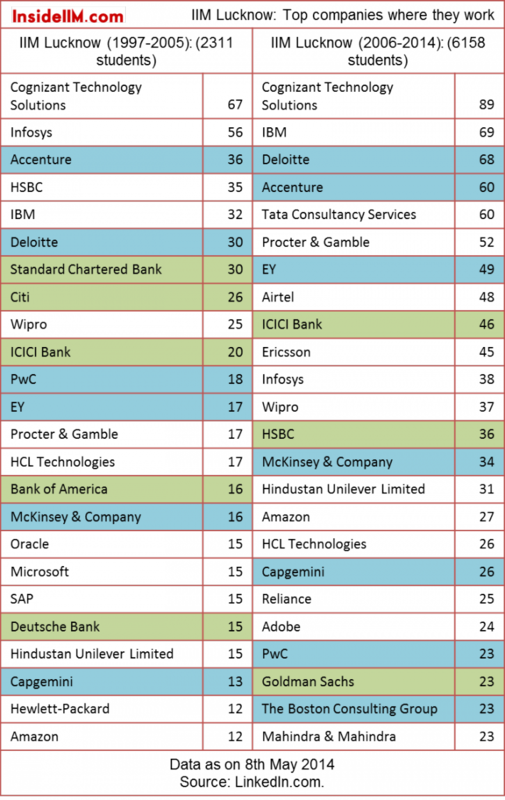 McKinsey is not even in the list for graduate set 1997-2005, but has a good 53 candidates working for it in the latter set. 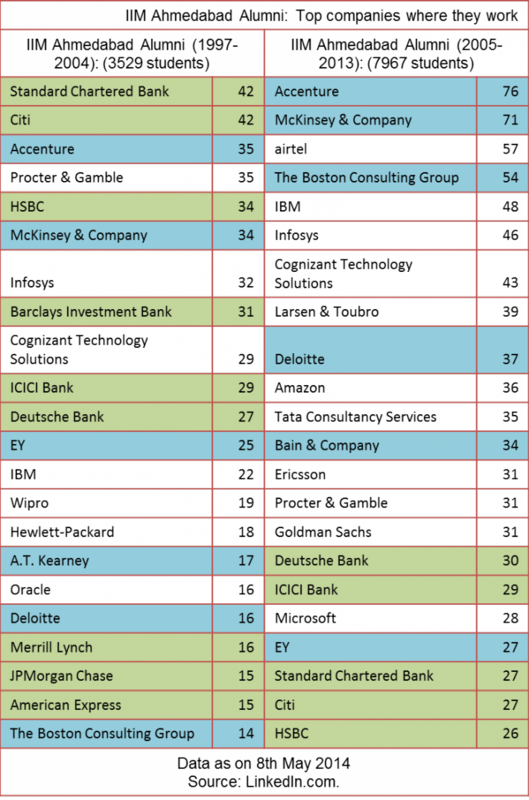 Clear that consulting firms are winning the war for talent. Again, data is coloured by the non-flagship programmes at IIMC. However, IIMC’s reputation for finance is well earned. 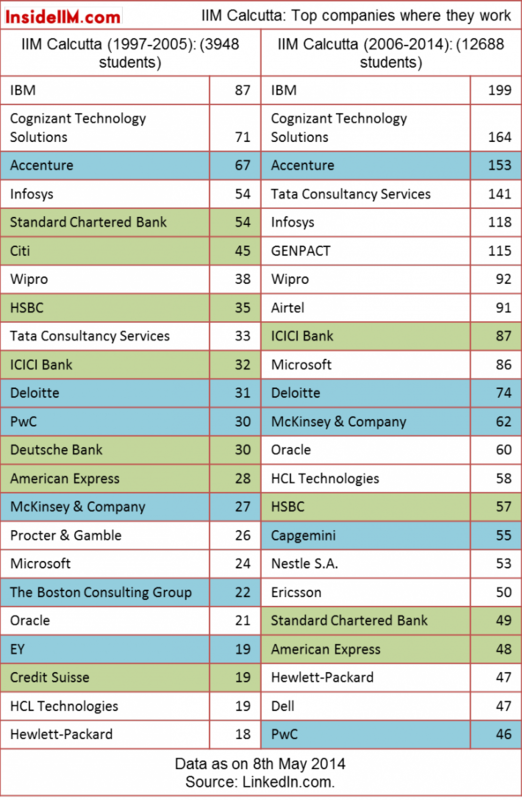 As you can see in the graphs above, consulting firms have not really been able to make any great inroads into the banking fortresses over the last few years. 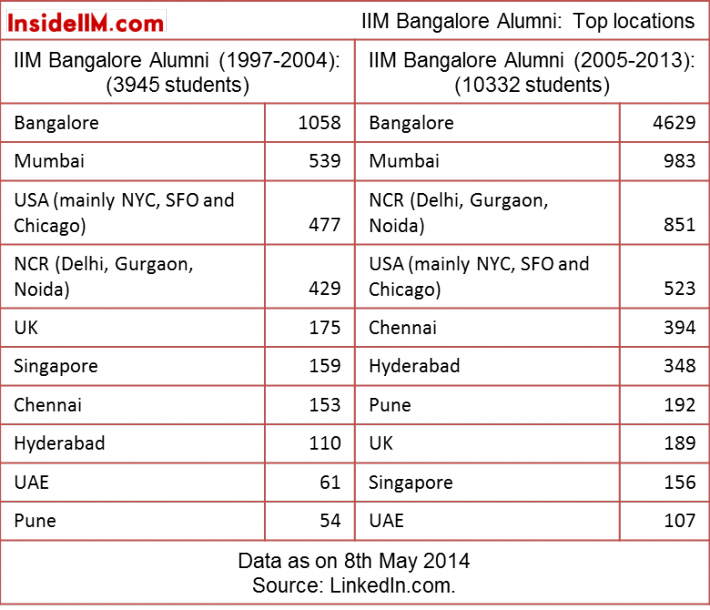 As noted last year, BCG has been a happy destination for IIM A and IIM B over the last few years, but IIM C less so. 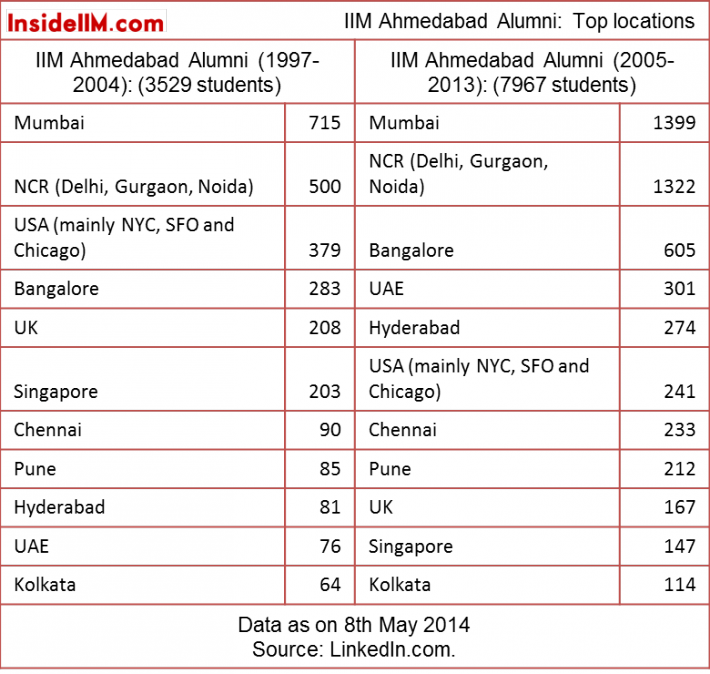 The analysis: Amazing performance by IIM L to have made inroads into BCG and McKinsey over the last few years. Again, consulting and operations jobs have become more popular as compared to finance jobs – see data on functional split. 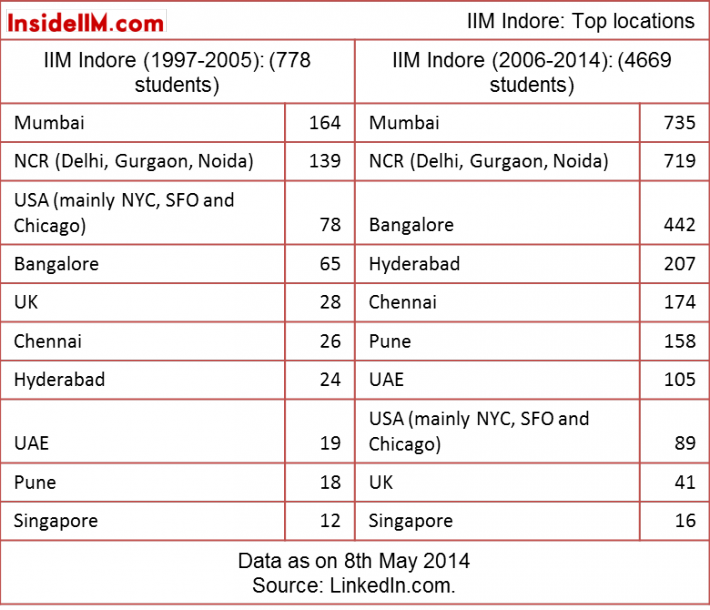 The analysis: IIM Indore seems to be one place where finance continues to retain some of its old allure. However, you must remember that some of the newly popular finance roles (Deutsche Bank in the second dataset for example) are not front end roles. The shift towards consulting is visible if you see function-wise data. – The financial crisis of 2008 forced large investment banks to go slow on their hiring decisions. – At the same time, these banks were, to some extent, able to capitalize on demand for finance roles by offering middle-office roles. 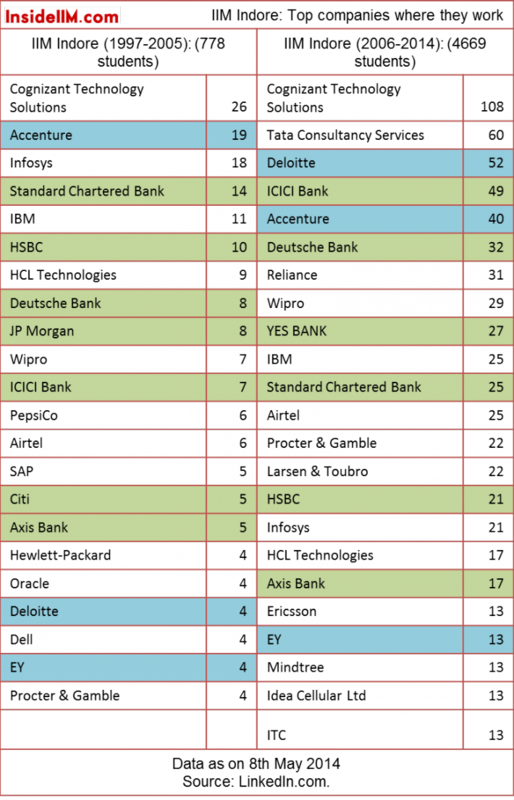 – Hiring by Indian banks for plain-old banking roles (as opposed to casino-style investment banking) has been robust as ever. We have no obsession with banking and consulting here. It’s just that most MBA aspirants are obsessed about these fields without even having the slightest clue of what kind of work it entails. 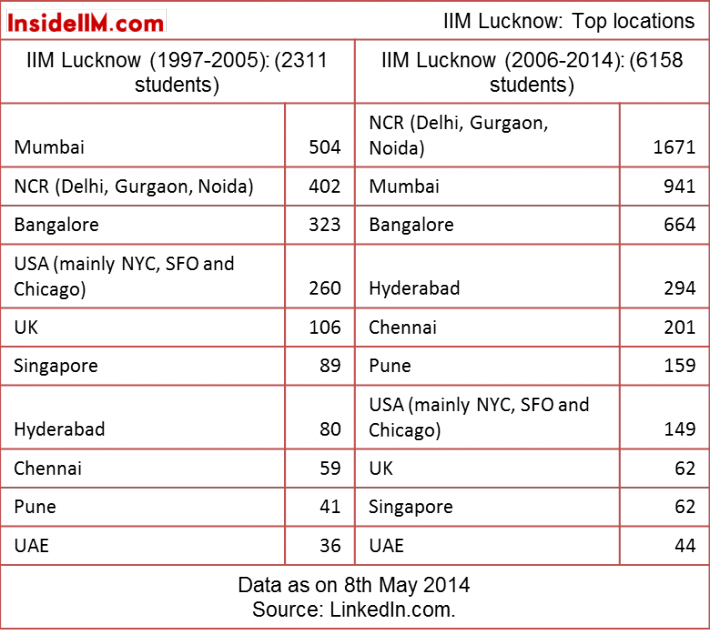 The over-representation of operations in IIMB is because of data other than the flagship program. 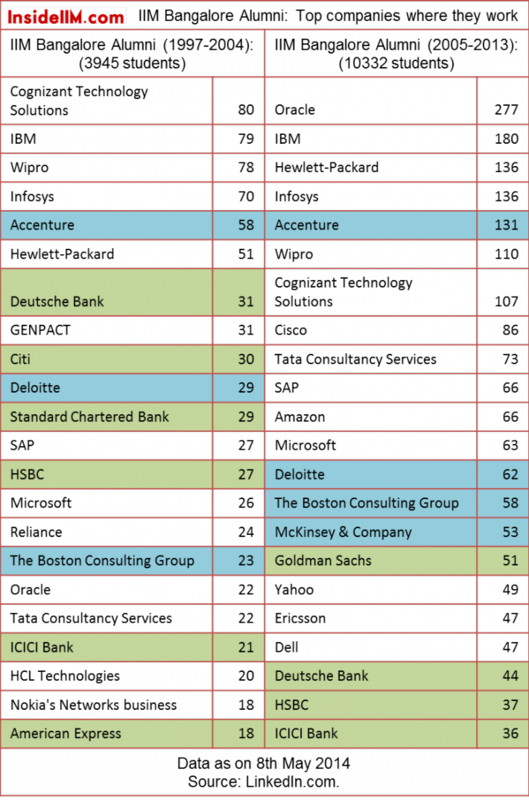 Why there is no KPMG? 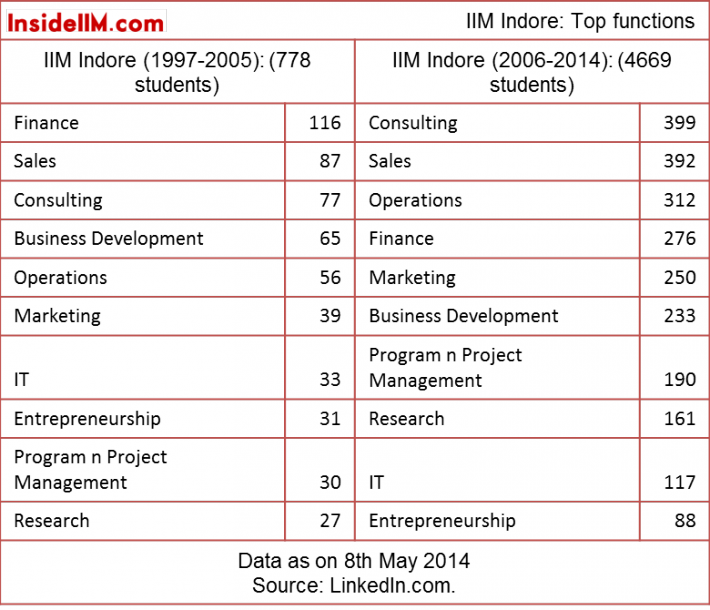 @team InsideIIM – I dont see any such course in IIMB that focus on operations as such… Is your reply really justifiable?